Greetings From The Road! I’m traveling out West this week. My travels started in Denver. I finished up my 11th year of judging at this year’s 37th annual edition of the Great American Beer Festival in Denver and am now heading to Oregon then on to Yakima, WA for Hop Selection. Every year at the end of summer I look forward to the GABF – the world’s biggest beer competition. The Fest takes place over 3 days, and this year, 62,000 people attended, over 4,000 total beers were being poured in the giant 500,000 square foot space at the Denver Convention Center in downtown Denver. 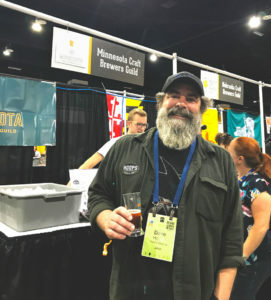 The GABF is truly a carnival of all things beer. Like many beer fests, Attendees get a small glass to wander the floor and try all types and styles of beer. There are also seminars, live radio and tv broadcasts, learn to brew exhibits, food of all types and other entertainment to explore. The highlight of this festival is the awards ceremony – a seriously tough ticket to score. Awards include gold, silver, and bronze medals in each style category. I like to call it the Academy Awards for brewers. This year 293 judges tasted and judged a total of 8,500 beers in the competition. 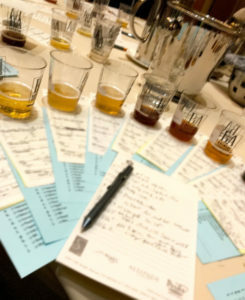 There were 102 competition styles of beer judged and a total of 306 medals were awarded. The math on that says about 3.5% of all entries received medals. I have had the honor of judging this competition for over a decade, and this year was the best, highest quality, and most fun yet. The average amount of beers entered in each style category this year was 86 with the largest category being nearly 400 entries. I judged that category and 15 more for a total of 179 beers judged this year. Each day we started the morning session at 8:30am, then a lunch and an afternoon session. Each session usually has 3 style categories to judge with an average beer count of about 12 or so entries per judge. I was impressed this year with the high quality of the majority of the beers I tried. The judges are very committed and serious about their jobs, we taste all day, get there early and keep focus. Becoming a judge is a rigorous project that requires many steps and expertise. I was told the waiting list is currently 3 years long and the majority of the folks I worked with this year had 10-15 years under their belts, so new blood gets added slowly as the competition grows. I am truly honored to participate at this level. I hoped you enjoyed Part 1. I will report back for Part 2 covering the Hops Selections in Yakima, the hop growing center of the USA, where I’ll take part in hop selections not only for myself, but also other Midwestern breweries to be used in 2018-2019. Cheers and see you down at the Beer Hall! © 2019 Hoops Brewing All Rights Reserved.